Yay! So glad readers nominated HOPE REBORN for the Grace Award! !’m thrilled and send thanks and also congratulations to all the other finalists! Best wishes to you and all the finalists. I’m glad Hope Reborn was nominated too. I love that readers nominate in this contest. Well deserved – congratulations to you and the other finalists. Ann, Thx so much on behalf of all the finalists. Love luv LoVe Tessa Afshar’s In The Field Of Grace. 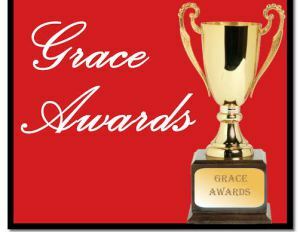 Kathryn, the Grace Awards sends best wishes to Tessa and to all the finalists. So happy that Carol McClain got nominated as one of the 3 finalists. She is a very deserving person for this honor, along with a wonderful book! Cheryl, I love the concept of her novel DWF. I bought it but haven’t had a chance to read it yet. Amy, You don’t know how deeply that touches me.